They say that you can be alone but not lonely. It is also mentioned that one can be in a crowd full of people and still feel alone. Perhaps this is the most uncomfortable kind of loneliness: the type where you go to a party only to arrive and then wish you had stayed home. But galavanting around Europe by yourself does not usually result in loneliness. I don’t think many people regret making the journey either. The gypsies who did this sort of thing inevitably had a way of finding one another. If you want to leave a foreign city with a new friend or enjoy some friendly conversation and the company of fellow expats, participating in the free group walking tour is a practical solution. You’ll be guaranteed to leave with at least one new acquaintance if you want, as well as hit most of the main sights of the city. Just look for the people in the red shirts, or blue shirts, or whatever color shirts they’re supposed to be wearing. Usually the crowd of wide-eyed travelers holding takeaway coffees, conveniently stationed in front of the most well-known central square or basilica is a dead giveaway. The tour guide stands in the middle of the circle, travelers from every which country in Europe surrounding her. She’s like the R.A. on your freshmen dorm floor, organizing everyone together for an “icebreaker game,” as she excitedly dishes the agenda to her herd. After the Hungarian crash course, she points to a statue of the old Hungarian policeman in his ancient uniform, mentioning how bored they often were before the wars. “They would stand around twirling their mustaches during the time of peace” she says, “Because there wasn’t much else to do. It’s become a tradition now for tourists to twirl it for good luck.” Looking closely, the tip of the mustache is tarnished and not as shiny as the rest of the statue. Tour guides who are good at their jobs always seem a bit like actors; they have a talent for captivating an audience with their natural charisma and ability to calculate in the right amount of jokes and little-known facts to hold the crowd’s attention. Perhaps, the “quirky” character guides were the most engaging, because you were compelled to keep listening for curiosity of what odd sentence might spill out of their mouth next. The pack meanders along to chain bridge over the Danube river, where Judit stops again and starts talking about Hungarian inventions, such as the ballpoint pen. She points to the two lions statues, situated at the end of the bridge, whose toothy grins are curiously lacking visible tongues. The posse of young backpackers, snapping photos in every which direction, continues across the bridge in a messy line, like a group of school kids on a field trip, up the steep hill to the Buda side of the city where the castle district lies. The scenery is something out of a disney movie: colorful ceramic tiles clothe the roof of the Matthias church, surrounded by the stone walkways and turrets of the fisherman’s bastion, which resemble a wall protecting a castle. The view from the top of the hill is perhaps even more handsome. 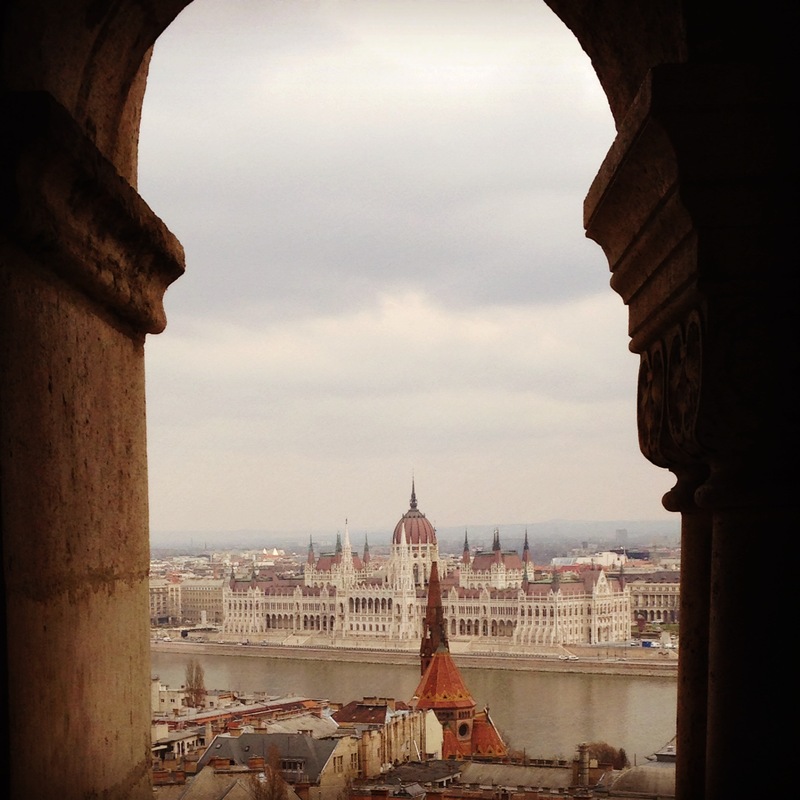 One can peer through the stone archways to look back at the Pest side of the city and the exquisite old Parliament building. Judit pauses at the splendid view, giving the travelers a few minutes to take in the atmosphere of this city that she knows like the back of her hand, but is a mysteriously foreign place to them. The tour has now come to an end, and she briefs her group on the Hungarian gastronomic specialties before they part ways. “What was the name of that dessert you mentioned with the poppy-seeds and walnuts?” says Julie. “Flondi Cake. I’ll write it down for you.” she says, “Where are you from by the way? I couldn’t figure it out from your accent.” Julie felt a bit proud for a moment, for she took this as a compliment in disguise. Wasn’t an accent that couldn’t be tied to a single place a mark of the worldly, well-traveled person? “À la prochaine,” she waves them out the door. “Merci. À la prochaine,” says Julie. “Does that mean goodbye?” says James, an Englishman. They exit the restaurant and stand on the curb next to the shrubbery where someone had hidden their bottle of convenience-store wine. In their youthful fashion, they each take swigs of the red wine as they pass the bottle off around the semi-circle. It made a couple more rotations through each person’s hands until it was emptied. The group dispersed and Julie found herself sitting next to James on one of the old metro lines lurching sharply and screeching to a halt at each stop until they exited at their hostel. The next day, there was the lingering regret of not asking for anyone’s contact information. In the midst of laughing and drinking, ordering soupe à l’oignon and croque monsieurs, one always took such a rendez-vous for granted. There seemed never to be a shortage of merriment and a party never required any effort during the festivity itself. Loneliness and boredom were immaterial feelings which one could not appreciate during such times and it seemed unfathomable that one would experience them again. There had been a German girl who Julie had spoken to on the tour in Budapest. The girl spoke perfect English and her accent had barely any German tinge to it that she could have passed as an American. She and Julie went to a Hungarian restaurant after the tour and ate goulash soup. She said that she had just finished studying abroad in Italy. Now, she was jet-setting off visiting all of the friends she had collected throughout Europe, pretending the days would never end when airports and train stations and cheap hotels were one’s home. Maybe it was comforting enough to know that there were people like her out there who you might bump into again someday in Paris or Budapest or elsewhere. One couldn’t say precisely when this would happen, but perhaps the spontaneity was what made it interesting. As one traveled through Europe, many of the cathedrals and chateaus, even the conversations with fellow travelers, became strikingly similar after a while. Yet, regardless of how far away one got from home, it was inevitable to run into seemingly familiar people. However, the really unique monument, the best conversations, the moments attached to the strongest emotions were almost impossible to forget. Perhaps these things were a bit like the tongues of the lion sculptures: just because you couldn’t always see them from head-on, didn’t mean they weren’t there somewhere, hidden and concealed from first glance. Really liked your blog and the way you so seamlessly tied in the tongueless lion sculpture to your closing paragraph. Nice foreboding. John Baltique.